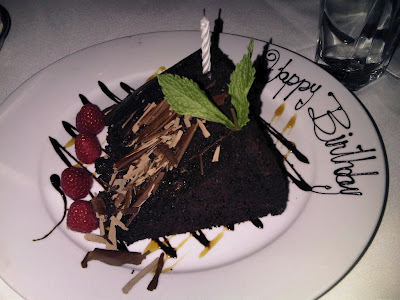 For Susan's official birthday dinner, a week later, we went to Mastro's Steakhouse. Those from California are familiar with Mastro's but they opened one here in Chicago a few months ago in River North and it's been doing really well. It was a packed night and really dim in there, so I didn't want to bust out my camera and annoy the parties next to us. I didn't take pictures until dessert, well after the place had cleared out. Sorry guys, I'll share with you what we ordered though. We got the Mastro's house salad, warm spinach salad and the chopped salad to start. All of them were great. Usually I end up gravitating towards one salad, but I have to say all of them were addicting. For our entrees, most of us ordered the steak, but I think Gook ordered the pork chop and he said it was excellent as well. I love coming with a big group to steakhouses because you get to order and try so many different sides. For our sides, we got their lobster mashed potatoes, brussels sprouts with pancetta, creamed corn, asparagus and sauteed mushrooms. Now for the desserts. 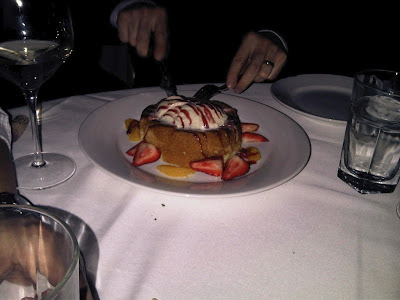 We ordered the butter cake, chocolate pudding cake and they surprised Susan with a slice of their chocolate cake. 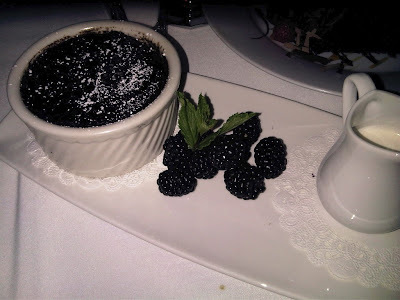 Here's the chocolate pudding cake with creme anglaise. It was gooey and warm. This is one huge slice of chocolaty cake for Susan. They are famous for their butter cake, which is like pound cake topped with vanilla ice cream, drizzled with caramel and raspberry sauce. It also comes with a bowl of fresh whipped cream. Talk about decadent. People seemed to like the butter cake and the pudding cake the best. The chocolate cake was a bit too dense. Why do I feel like I need to go on a juice cleanse all of the sudden?